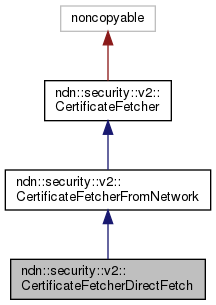 Extends CertificateFetcherFromNetwork to fetch certificates from the incoming face of the packet. During Interest and Data validation, if IncomingFaceId tag is present on the original Interest, this fetcher will send a "direct Interest" to fetch certificates from the face where the original packet was received, in addition to fetching from the infrastructure. The application must enable NextHopFaceId privilege on the face used by this fetcher prior to the validation. Definition at line 40 of file certificate-fetcher-direct-fetch.hpp. Definition at line 30 of file certificate-fetcher-direct-fetch.cpp. Definition at line 36 of file certificate-fetcher-direct-fetch.cpp. 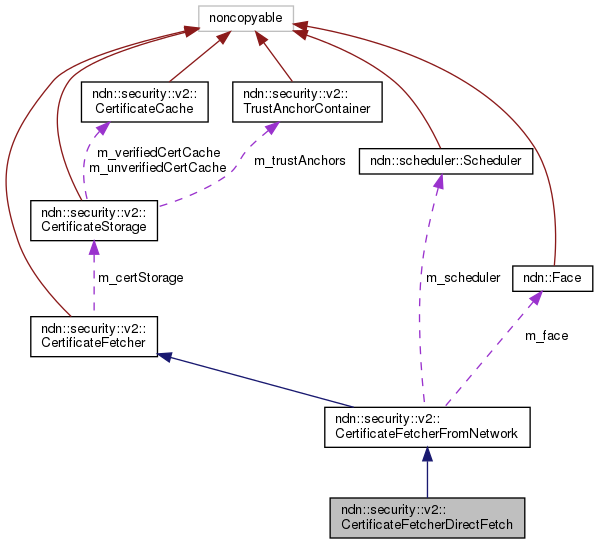 References ndn::security::v2::CertificateFetcherFromNetwork::doFetch(), ndn::Face::expressInterest(), ndn::SimpleTag< T, TypeId >::get(), ndn::security::v2::CertificateFetcherFromNetwork::m_face, ndn::Interest::refreshNonce(), and ndn::TagHost::setTag().